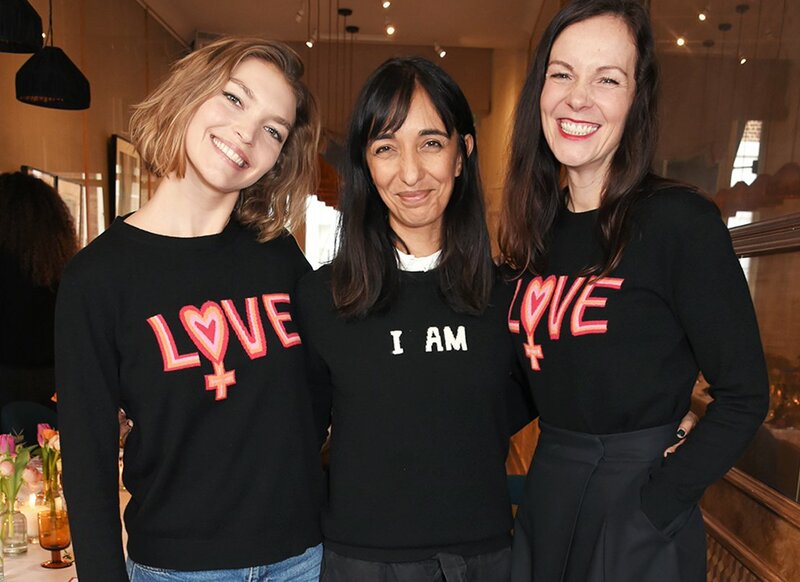 Our latest collaboration is a very special one indeed: We’ve joined forces with Women for Women International to create a collection that celebrates the many aspects of womanhood – and 100% of the proceeds will go to this fantastic charity. Women for Women International supports women survivors of war in some of the most dangerous places in the world. Ahead of the launch, we sat down with Women for Women International Ambassador Arizona Muse and Chinti & Parker co-founder Anna Singh to discuss the inspiration behind the designs, the importance of International Women’s Day, and what it really means to be a woman today. Tell us a bit about the collaboration. Anna: It’s a partnership between Chinti & Parker, the charity Women for Women International, and Arizona Muse, who is already an ambassador for the organisation that helps women in war-torn countries rebuild their lives. The collection includes our signature cashmere crew neck sweaters with statement intarsias and a printed t-shirt that all celebrate womanhood. It’s launching ahead of International Women’s Day this year, and 100% of the proceeds will go to support the work of the charity. What inspired the collection's designs? 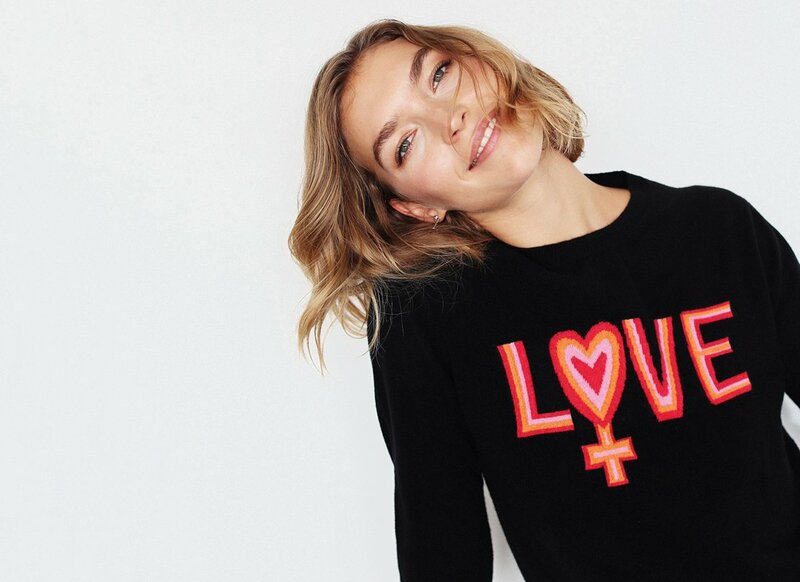 Anna: We wanted to use existing signatures, such as slogans, hearts, and the Love Sweater, and give them a womanhood spin. 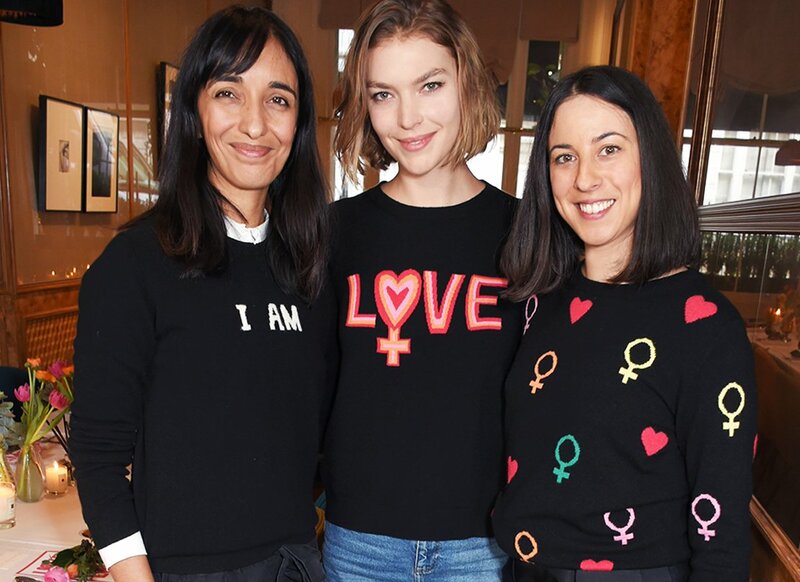 We ended up using the traditional female Venus symbol and playing with that, as well as a slogan sweater and t-shirt outlining some of the key roles that a woman can play. Anna: It goes without saying that there are women all over the world living in circumstances that make it impossible for them to better their lives and the conditions of their families due to forces outside their control. Women for Women International are responding to this in a unique way by offering a long-term solution to a bigger problem. Arizona: I love that Women for Women International has found a way to give to women something that stays with them forever and nothing can take from them: education about their rights and new skills. Which is your favourite piece from the collaboration? Arizona: The Love Women Sweater. Anna: The Sister Love Sweater. Anna: It’s important because if we are lucky enough to live in a more stable part of the world, we owe it to other women to help. Those who don’t have access to education, who have been stripped of their rights, who despite being very hard workers, are finding it hard to support their families. They need a hand, and the Day is a call to not turn a blind eye. Arizona: Women and men and children need a day to actively celebrate the women in their lives and show gratitude so that women feel appreciated. What does it mean to you to celebrate womanhood? Anna: To celebrate all the unique gifts to the world that the feminine energy brings – from creativity to intuition. Arizona: I am so lucky, I have grown up in a society where I have been appreciated equally to my male counterparts. I am aware that this doesn’t happen to all women all over the world. For me to celebrate womanhood means to be grateful for this. What will you be doing to mark International Women’s Day this year? Anna: Spending time with the most important women in my life, my daughter, my friends, and my mum! Arizona: I will be calling my mom! What does it mean to you to be a woman in 2018? Anna: It means wearing many, many hats and making sure I contribute to a world my daughter can thrive in as she grows up. Arizona: That’s a pretty easy question to answer, it means that I will carry on as normal because I’m allowed and encouraged to do whatever I want. And for this I am acutely grateful. It is a true privilege that is not to be taken for granted.